On Saturday December 6, Joe Johnson and His Band played a benefit for TESSA at Stargazer's Theatre in Colorado Springs. The Barrel House String Band opened the show with a very enjoyable set of rocking bluegrass music. Next, Johnson, who was the heart of The Manitou Springs band Creating A Newsense delivered a focused and well played set of mostly original music, with Conor Bourgal of the band Changing Colors taking the helm for a couple of his own songs in the middle of the set. Johnson and the band started out playing mostly mellow original songs, but built the set to a well played climax with "Who's Gonna Go Your Bond" which I think is one of his best songs. Instead of doing the typical go off stage to hear the crowd cheering them back to the stage thing that most bands do, Johnson just played three more songs, including one of my favorites, "Where the Mountains Meet the Sky" to end the show. I made a recording of both bands and the recordings are available by following the links below. I have also uploaded some photos of both bands which are also available by following the links below. On Monday, November 10 I did something I haven't done in a very long time. I went to a record store and bought a new compact disc on the same day it was officially released. I've also read that Pink Floyd's - The Endless River release broke Amazon.com's all time CD pre-order record set by One Direction's Midnight Memories in 2013. So, it looks like there are still quite a few Pink Floyd fans like me out there. Knowing that Pink Floyd, a band that definitively shaped my early appreciation for music, was releasing a new album this month, I'd been listening to the band's past recordings to prepare myself for hearing their first new music released in twenty years. 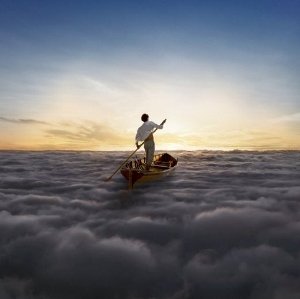 The cover art, an image of a man pushing a boat through clouds into a sunset brings to mind the late Pink Floyd keyboard player Rick Wright who the album pays tribute to. The image also conveys the message, confirmed by David Gilmour and Nick Mason, that this is likely Pink Floyd's last album. 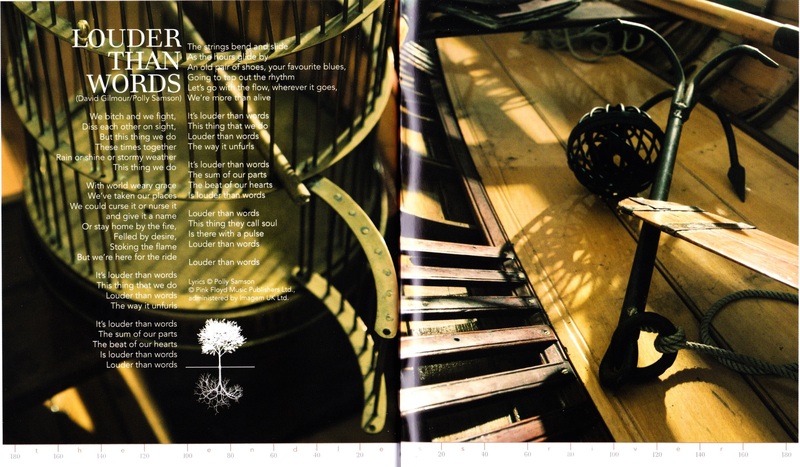 The Endless River is not packaged in a typical CD jewel case, but in a nicely bound booklet with several pages of images, including some photos of the band members along with the full album credits. There are 18 songs divided under four headings, labeled as Sides which are listed on the back of the booklet. The obvious intent being that this is a double LP album all contained on a single compact disc. The total album length is 53:04 minutes. My first listening was straight through the whole CD on a set of good headphones. The first song, "Things Left Unsaid" starts with an ethereal fade in and several voices speaking, much like the voices that are incorporated into the group's The Dark Side Of The Moon album. The vibe gets somewhat new agey in an East Indian way as sitar-like instrumentation, provided by Gilmour using an EBow comes in halfway through the four and a half minute song. There are no drums or lyrical vocals on this track and the writing credit goes to David Gilmour and Richard Wright. "Things Left Unsaid" segues seamlessly into "It's What We Do" which harkens back to "Welcome To the Machine" from the Wish You Were Here album. The name of the song obviously alludes to the similarity, as I found this to be the most Roger Waters era Pink Floyd sounding song on the album. As it segued into "Ebb and Flow" I wished it was longer, as it ended just as I thought the song was taking off musically. 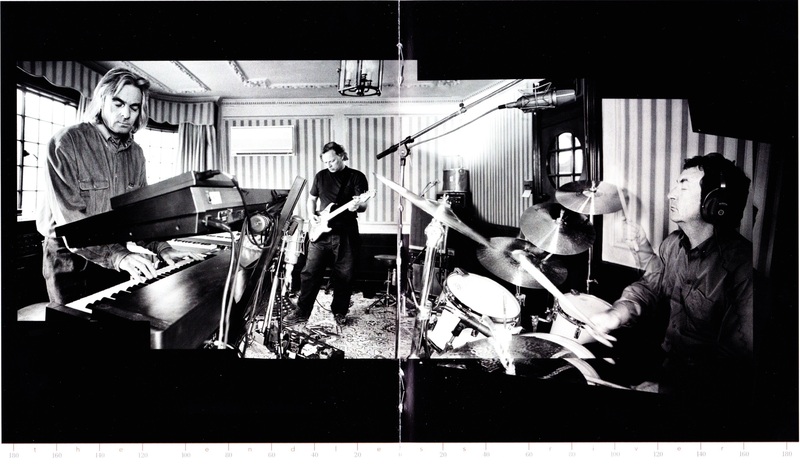 The 1:56 minute long "Ebb and Flow" reprises Gilmour's EBow instrumentation heard on the first song of the album and finishes the first Side. Side two opens with the track "Sum" which starts with a very nice, wide stereo keyboard image when heard on headphones. The heavier lead guitar and prominent drums in the middle of the song remind me of Gilmour and Mason's work on the album The Wall. "Skins" follows, and appropriately features Mason's drumming with edgy "Saucerful Of Secrets" invoking accompaniment from Wright on keyboards and Gilmour on guitar. The very short "Unsung" provides a transition into "Anisina" which is almost a fully fleshed out song which immediately calls to mind Wright's beautiful "Us and Them" from The Dark Side Of the Moon but without the vocals. A saxophone break adds much needed weight to the song, but without vocals, the song just doesn't sound complete to me. Six short, less than two minutes each, mood setting and seamlessly linked instrumental pieces get Side three started. This Side ends with the almost three and a half minute long "Talkin' Hawkin'." This song reprises the sound of Steven's Hawking's voice processor which was heard on the band's "Keep Talking" from The Division Bell album. For me, this is the most satisfying song in the Side three grouping and clearly sounds like the type of song Pink Floyd recorded after Roger Waters left the band. Also noteworthy are the tracks "Allons-Y (1)" and "Allons-Y (2)" which strongly mimic "Run Like Hell" from The Wall, but are not as engaging. The modern orchestral and ethereal "Calling" starts Side four and calls to mind vast, wide-open outer space for me. It is grandiose, and builds momentum, but segues too quickly into the transitional "Eyes To Pearls." The acoustic guitar driven "Surfacing" is quite nice too, but like many of the pieces on the album, starts out with lots of promise but doesn't deliver a payoff in the end. "Louder Than Words", the last track and only song with lyrics on the album, starts out sounding like "Hey You" from The Wall, but soon morphs into a song that could have easily been included on The Division Bell album. It is so nice to hear Gilmour's voice, finally. It grounds the song and properly finishes the album. It really makes me wish Gilmour had added lyrical vocals to more of the songs here. Even though I thoroughly enjoyed it, I feel less than fully satisfied with this album. But, to be honest, that is true of most albums. It works well as an instrumental tribute to Rick Wright, who gets writing credit on most of the songs and who's keyboard playing is featured on most of the CD. I wonder... why is there only one song with lyrics? Hearing more Gilmour vocals would go a long way to making this a better Pink Floyd record for me. Ultimately The Endless River is a very pleasant smattering of sparks and pink coloured smoke that don't ignite a fire. The ethereal nature of the collection as a whole makes me feel nostalgic for the Pink Floyd of the 1960's and 1970's. Like many long time Pink Floyd fans I believe the group peaked during the Roger Waters era. However, I know I will listen to this album much more than I've listened to the group's last release with Water's, The Final Cut. Some die-hards still call that the last Pink Floyd album. I'm glad Gilmour, Mason and Wright didn't believe that, because The Endless River sounds to me like Pink Floyd's true finale. 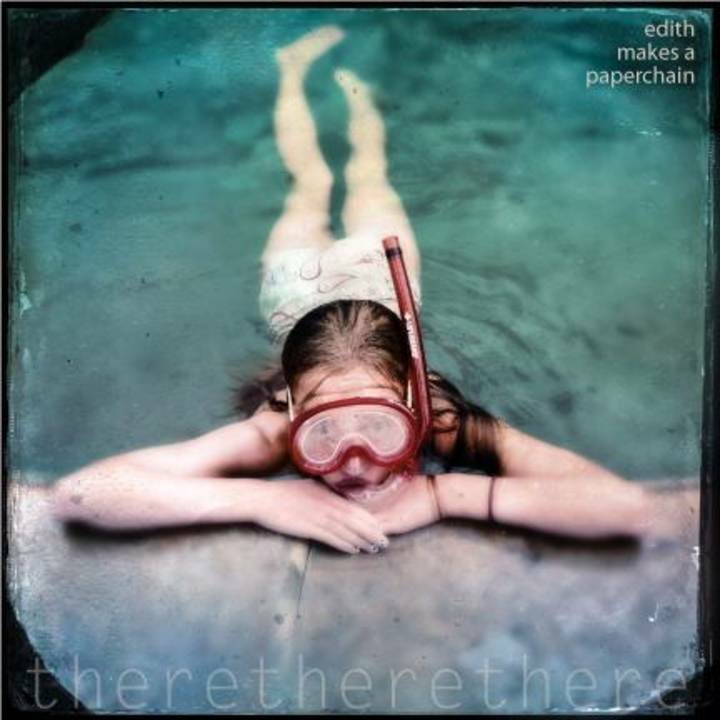 Local folk favorites Edith Makes A Paperchain officially released their latest CD titled There There There at Stargazer's Theatre in Colorado Springs on Saturday night. It's the group's first album release in six years and there was an enthusiastic audience assembled to celebrate the event with them. The evening of gentle music started at 8 PM with local musical prodigy Miette Hope-Goldman performing solo. A member of the band when the album was recorded and back home from her studies at the Berklee School of Music, Hope-Goldman gave us a mesmerizing performance of mostly original songs. I really enjoyed her short set which ended with a new song, "Back Then." I left the venue at the end of the night with the chorus of that song playing over and over in my head. Up next was a band I had not seen before. Denver's, The Still Tide performed as a three-piece; fronted by Anna Morsett on guitar and vocals joined by Jake Miller on lead guitar and Natalie Tate playing drums and keyboards. The crowd was unusually attentive and responded enthusiastically after every one of the groups atmospheric songs. Jake Miller's innovative and tasteful guitar accompaniment paired with Morsett's sweet and sultry voice was a pleasure to hear. Edith Makes A Paperchain played last and performed their new album There There There. Hearing the three female vocalists, Sarah Hope, Miette Hope-Goldman and Xanthe Alexis sing together was ethereal at times. But, I especially enjoyed hearing Sarah and her daughter Miette sing "Firesong" together in a stripped down rendition of the song. The band finished the night by responding to a standing ovation with the catchy song "Stove" from their album Tunes For Tripping Down Stairs. I recorded all of the bands and have posted those recordings on my Recordings page. Photos I took of each group are also available by following the links below. I was struck by how well the live music scene in Colorado Springs is flourishing after attending the annual What If... Festival held in downtown Colorado Springs on Saturday. 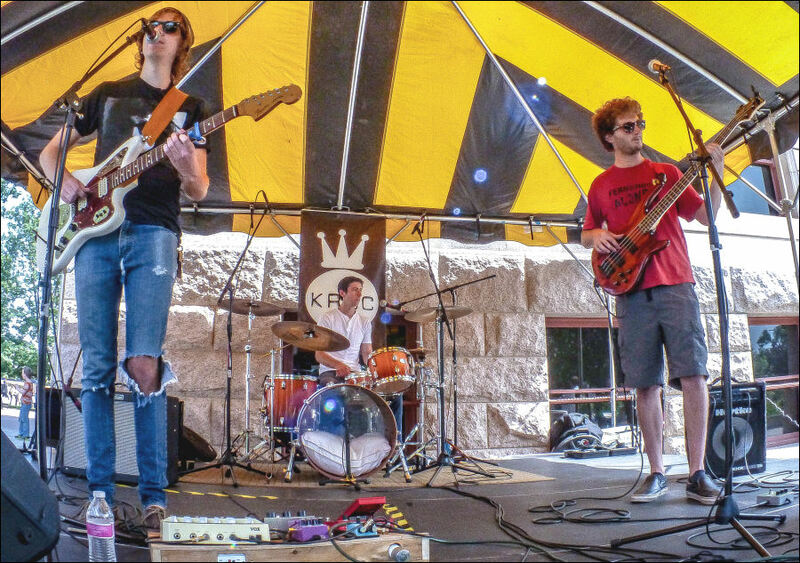 I recorded two popular Colorado Springs bands that played on the KRCC stage which was set-up just in front of the Pioneers Museum off Tejon Street. Edith Makes A Paperchain began their set just before 12:15 PM. The rich vocals, acoustic rhythm guitar, tasteful drums and bass accented with horn flourishes and minimalist electric guitar playing sounds happily nostalgic in a good way. I really enjoyed their all original 45 minute long set, especially the strong vocals by Sarah Hope and recent addition to the band singer Xanthe Alexis. 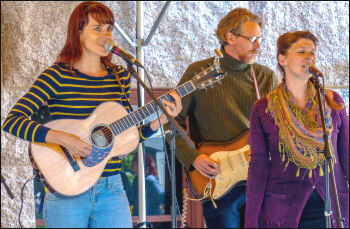 Their songs have a youthful, optimistic and joyful feel to them, especially "Strange Boy," the more contemplative "Edelweiss," with triumphant horn playing and the more up tempo, ukulele driven "Stove." Up next on the KRCC stage was another popular Colorado Springs band, We Are Not A Glum Lot, who started playing at 1:20 PM. Having recently trimmed down to play as a trio, these guys sound different every time I see them. Their music ranges from gentle ambient instrumental passages to intense and raging with angry vocals, all in the same set. An equipment problem marred the end of their performance, so I won't be posting the recording I made. But, I did record Edith Makes A Paperchain and I took pictures of both bands that can be accessed by following the links below. On Thursday, September 4, the annual Indy Music Awards Festival was held in downtown Colorado Springs. 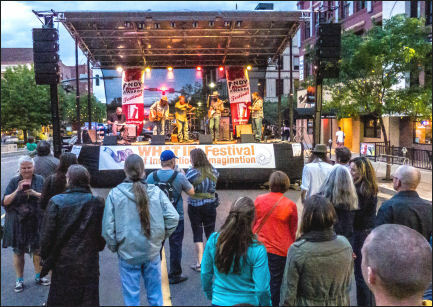 The event which is organized by the Colorado Springs Independent newspaper was also the kick-off for the weekend long What If... Festival that's held annually in the city. Joe Johnson with his band were the first performers to play on the main stage which was set-up between Kiowa Street and Pikes Peak Avenue on Tejon Street. Johnson kicked off the 35 minute long set at 7:05 PM with his original song "Where the Earth Meets the Sky" played solo on acoustic guitar. His band backed him for the rest of the performance. The short set of all original songs was well received by the medium sized audience. Dark clouds threatened to rain before and during the set. This may have kept some fans at home, but no rain fell and the people that did attend were treated to an excellent performance by Johnson and his band. The highlights of the set for me were "Bishop's Castle" and the hard driving "Who's Gonna Go Your Bond." The sound was very good, but occasionally there was annoying sound bleed from the other stage that was set up facing the main stage less than a block away. I recorded the set and took some photos which can be accessed by following the links below. 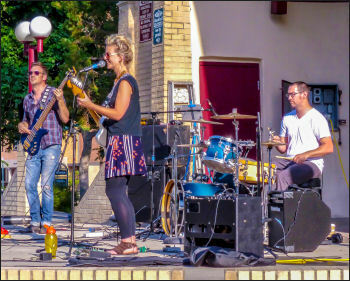 I hadn't seen Colorado Springs three piece band Water Bear perform before their Saturday July 19 set at the Acacia Park bandshell. Singer and guitarist Kellie Palmblad backed by Brett Andrus on bass guitar and electronics and drummer Joel Brown performed a very enjoyable set of all original songs. I was particularly drawn to Palmblad's confident and sulty vocals during the 45 minute long, nine song set. "Rust Colored Sun" stood out as the best song of the set for me for it's complexity which gave each band member room to stretch out musically. Up next was We Are Not A Glum Lot who I have seen a few times and and always enjoy. This time they performed as a three piece without Colin Foxwell playing violin. I have to say I missed his contribution at this show. They started their set with "Chandler", which I immediately recognized as one of their best songs. They played a couple of instrumental songs I hadn't heard before and closed with "Country Song", which spotlights band leader Sam Erickson's guitar playing. I have made my recording of Water Bear's set available for live streaming and download on the Recordings page. Photos I took during each bands set are also available via the links below. Commercial Real Estate Brokers Cushman and Wakefield have hosted a free summer concert series at the Palmer Center in Colorado Springs every year for many years. 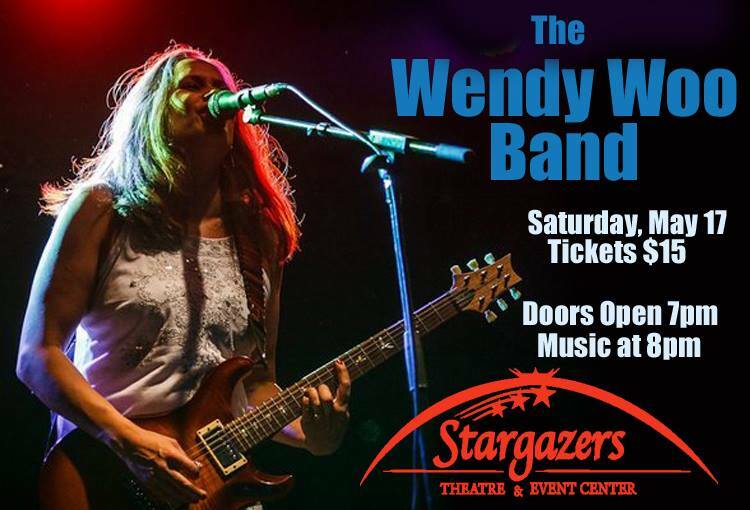 The Wendy Woo band have performed every year the events have been presented. The performances run between 11:30 AM and 1 PM on Friday's in the summer at the outdoor amphitheatre in front of the Hilton Antlers Hotel. It was sunny, hot and very windy at times on July 11 for the group's lunchtime concert. I was thinking it was a "Windy" Woo show during some of the stronger wind gusts. Singer-songwriter Wendy Woo played acoustic and electric guitars backed by long time band member and versatile multi-instrumentalist Chris Maestas on drums and vocals and Steve Cox on bass guitar. I appreciated Cox's melodic and innovative electric bass playing along with Meastas powerful drum playing during this performance. The trio started the set a little after 11:30 AM by playing the relatively new original, "Hey, Bartender" followed by a cover of John Mayer's "Why Georgia." I have always liked the bands interpretation of the Mayer classic and the trio played it very well this time. Woo and the band connected well with the audience and earned generous applause after every song. The eighteen song set was comprised of old and new originals as well as a few cover songs. Originals "Walk Along the Water", "Another September", "Late Night Sunrise > Surprise Me" and "Walking the Skyline" were some of the highlights for me. I enjoy the delicate instrumental "Late Night Sunrise" that always precedes "Surprise Me" every time I hear it. I recorded the hour and twenty-two minute long set and took some photos. The recording and photos can be found by following the links below. 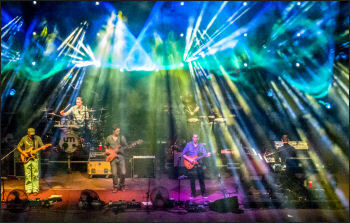 Chicago, Illinois progressive rock band Umphrey's McGee sold out Red Rocks Amphitheatre with Moon Taxi and The Motet supporting on Saturday, July 5. It was a very warm summer evening in Morrison, CO on the day of the show. Moon Taxi from Nashville started playing around 6 PM. One of the people sitting with me called them a pop/jam band. That's a fair description from what I heard. They played a set of mostly original songs which were well received by the audience who were slowly trickling into the venue. Colorado's improvisational funk band The Motet were up next and did a good job of getting the growing audience up and dancing. I'd seen the Motet before and was reminded about how good they are. Their high energy performances are always entertaining. 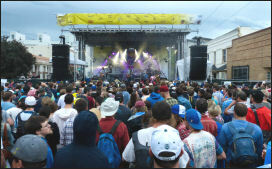 The 9,500 seat outdoor venue was packed when Umphrey's McGee took the stage around 10 PM. 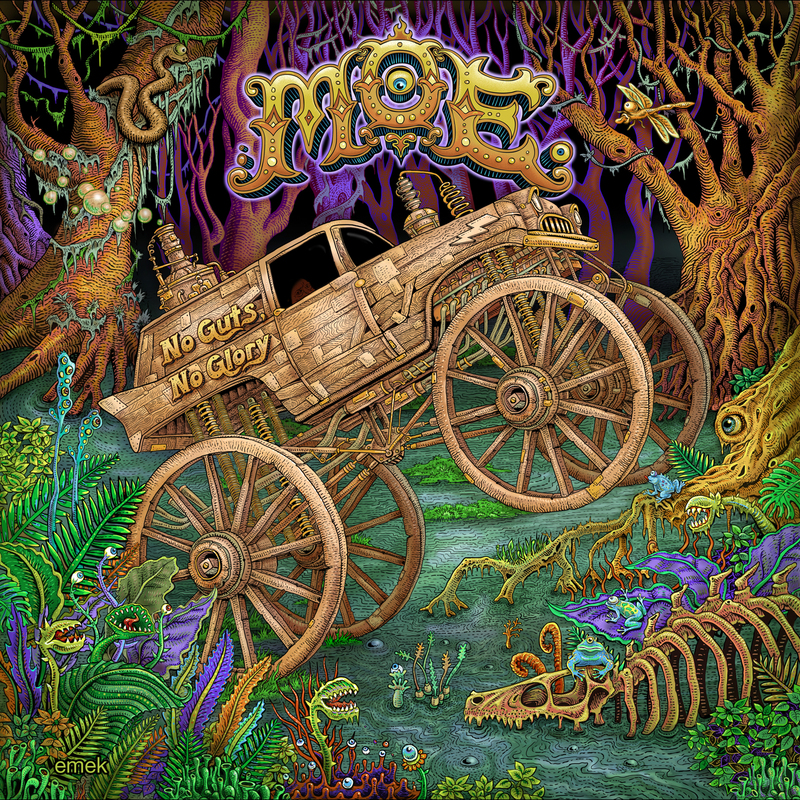 I had only seen Umphrey's McGee once before when they played on a double bill with moe. in 2006. The first set was very good and featured, "Cut the Cable," "JaJunk" (unfinished), "Ocean Billy," and the debut of "Educated Guess" from the recently released Similar Skin album. They have a heavier, more hard rock sound than they did back in '06. The six piece band closed the set with lead guitarist Jake Cinninger singing a cover of Bob Seger's anthem "Hollywood Nights." That song choice was weird and felt out of place to me, but they played it well. The second set started with Cinninger singing "Little Gift," a song I recognized from the band's new album. The song was short, but rocked hard and was a good choice to start the set. That song lead into another UM favorite, "Bridgeless" which they left unfinished before segueing into "Bad Friday." So far, the music was really good, but the lights were, at times, incredible. I tried to capture the great lighting while getting good shots of the band from the taper's section behind the sound board, but my pictures don't do the artistry of the lighting any justice. The lights really drew me in and embellished the music and never felt distracting. After playing the original "Dump City," Brendan Bayliss told a funny but relevant story about a discussion he had with the head of the schools music department during his sophomore year in college. Bayliss told us the professor had discouraging words for anyone trying to pursue a career in music without formal training and the ability to read music. So, Bayliss told us he now had two words for that professor, "Red Rocks." Then the band launched into the brilliant UM original "Slacker" which settled that discussion. They ended the second set by completing "JaJunk" which was started but left unfinished during the first set. Members of the Motet joined UM for the first encore song, a nice cover of The Band's "Ophelia." Then, the band played "Hajimemashite" which segued nicely to finish "Bridgeless." The show ended just before 1 AM. All in all, I thought it was very good, long evening of music. I audio recorded The Motet and Umphrey's McGee. I prefer the omni-directional microphone recording I made of Umphrey's McGee, but I uploaded my Microtech Gefell M300 (cardioid) source too. A very special thank you to Jon McLennand for providing me with the ticket to record this sold out show. You can listen to and or download the recordings I made from the Internet Archive links I posted below. I also took some photos of each band that played. Those pictures are hosted on this site too. 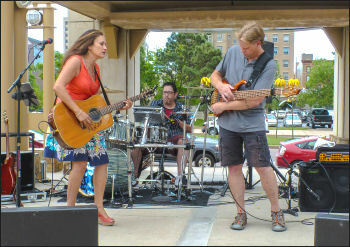 The free Saturday evening concerts in Acacia Park attract music lovers and families to downtown Colorado Springs on Saturday evenings in the summer. 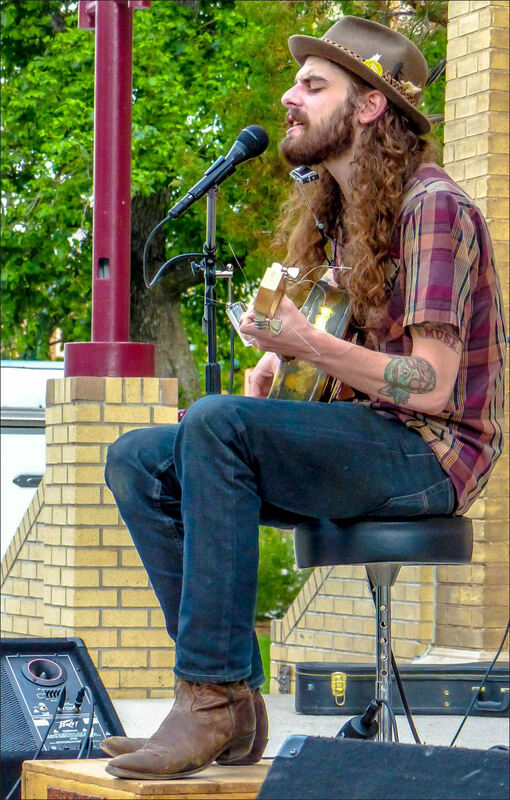 Chancy Crandall opened the evening at 6 PM on June 28 with a set of original songs. His singer, song writer style is laid back and easy to listen to. He got enthusiastic applause at the end of nearly every song he played. I enjoyed listening to his voice which reminded at times of Van Morrison. It was a beautiful summer evening, with kids playing, couples and families sitting on lawn chairs and blankets and listening intently to the music. Eros and the Eschaton started playing around 7 PM. The band consists of husband and wife Adam Hawkins and Kate Perdoni on keyboards, synthesizers, effects and guitars with Alex Koshak on drums. Also, each member of the band played drums at some point throughout the performance. I was immediately struck by the quality of Hawkins voice during the first song, "Weight Of Matter." It was crisp and pure and very engaging. Perdoni's accompaniment made it even sweeter. The only cover song played during the set, Lou Reed's "Sunday Morning" was unexpected and performed very well. The very catchy "War Comes Home" which followed was one of my favorite songs of the night. Sirens from police cars on Nevada Avenue that borders the park came in almost perfectly as that song started. The set ended with the original "Terrance McKenna" followed by "You Know I Do." I heard the eros during the band's hour long set, specifically "Little Dreamer" and "Heaven Inside" but the last song, "You Know I Do" delivered the eschaton. The 12 minute long epic started with synth sounds, steady kick drum and beautiful vocals from Perdoni and Hawkins but became bombastic and swelled with guitar feedback and expert accompaniment by Koshak on the drums at the end. I haven't ever heard that type of dissonance at this venue. The predominantly young crowd clapped and cheered enthusiastically at the end of the song. I felt invigorated and excited as the band left the stage. I thought it was a great set that was very entertaining and quite different than the music I typically hear in Acacia Park in Colorado Springs. 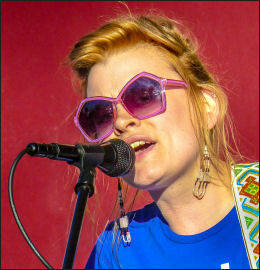 You can listen to my recording of Eros and the Eschaton set and view photos of both acts by following the links below. 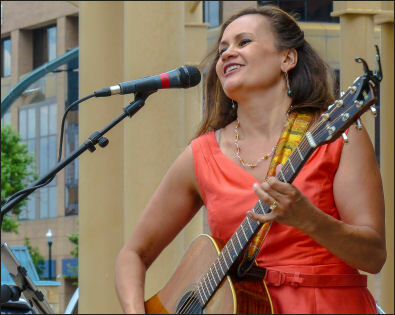 For the past four years The Modbo Museum/Art Gallery and several other Colorado Springs businesses have sponsored a free concert series held in Acacia Park on Saturday evenings throughout the summer. 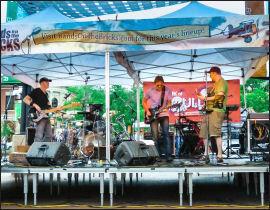 On the first day of summer this year the line-up was Grant Sabin solo, and Joe Uveges' band McGuireville who each played about one hour long sets from approximately 6 PM to 8 PM in downtown Colorado Springs. I've seen Sabin perform many times, but always with a band, never solo. His blues sets are always intense and very focused. Played solo, his songs became even more intense and personal. I have to admit to being a real Grant Sabin fan. There is something about his raw vocal and guitar delivery that resonates with me. He delivers when it comes to the blues. After a brief introduction by Brett and Lauren Andrus, owners of the ModBo Gallery, Sabin launched into "Dreaming'" from his 2012 Anthromusicology album. "Homesick" and the lively and unique "Ghost Pigeons" were next. I had not heard the more restrained "Bliss and Bane" or the haunting and deliberate new song "The River Is Poisoned" previously and I really enjoyed them both. He had the attention of the good sized Acacia Park crowd and continued on with gospel inspired "Well, Oh Well" which had several people around me clapping in time with the music. The set ended with "The Far Forgotten Friend" and "Sanctuary" which were new sounding to my ears. Every time I see Sabin perform I am impressed and this time was no exception. He's the real deal and is worth seeking out to see and hear. Visit his FaceBook page for his performance schedule and up to date information. I really want to get a good recording of Joe Uveges and the band, but this time it didn't work out. I did take some photos of his set and posted them under the name of the band McGuireville. You can listen to my recording of Grant Sabin's set and check out the photos of both acts by following the links below. On Saturday, June 14, moe. 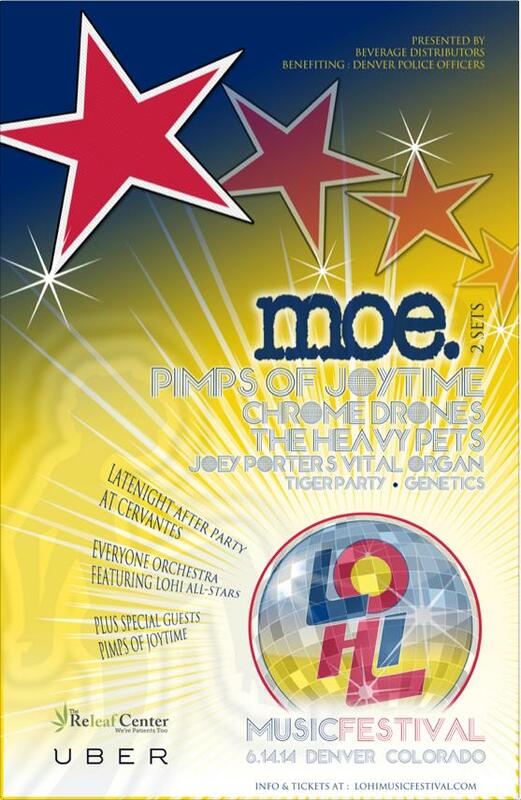 headlined the LoHi Music Festival 2014 in downtown Denver. I had been looking forward to this concert for months. The band who recently released a new studio album, No Guts, No Glory were scheduled to take the stage at 6 PM. I arrived about 90 minutes before show time and set up to record dead center in front of the stage. I didn't get a good estimate of the crowd size, but it was very crowded in the area I set up to record. The band took the stage on time after a brief introduction. They played "Billy Goat," from the new album No Guts, No Glory first. They have been playing this song for a while now, so I was very familiar with it and it sound great. "Little Miss Cup Half Empty" also from the new album was next. It was my first time hearing this song live and I enjoyed it. "Stranger Than Fiction" and "Queen Of Everything" followed. So far, the band played shorter less jamming songs. So, I was happy to hear the longer combination of "Spin Of A Dog" > "Buster" next. "Wind It Up" finished the hour long set. The band took a scheduled 90 minute long break between sets. Set two started with a fan favorite song by Rob Derhak, "Captain America" which I thought sounded very good. That song segued nicely into Chuck Garvey's "Annihilation Blues" from the new album. This was one of my favorite songs of the night. It has that perfect amount of Garvey quirkiness that makes it fun to hear. Next was Al Schnier's politically themed, "George" which segued nicely into another older song from the repertoire "Gone." Schnier sang "This I Know" from No Guts, No Glory next. This turned out to be the last song they would play from the new album at this show. I thought the new songs fit in very well with the established songs. I immediately recognized the tip of the hat to the LoHi festival when Garvey launched into his song "Hi & Lo." During "Bring You Down" there was a very short, but annoying power glitch that muted the sound from the PA system briefly. A strong rendition of "Brent Black" finished off the second set. The audience seemed too drunk and busy talking to cheer the band back to the stage for an encore, but the band did come back. "Plane Crash" one of my favorite moe. songs was the encore and the show was over. My recording and some photos I took at the event can be found by following the links below. The last thing I saw before I left work to drive up to Boulder was a picture Sean Kelly just posted on his Facebook page of his fiance in the hospital getting ready to give birth to his first child. 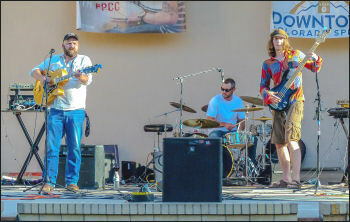 Sean Kelly, the remaining original member of The Samples and his band were scheduled to play a free concert at the Pearl Street Mall in Boulder. It was raining while I was stuck in traffic in Denver. I really doubted whether the show was going to happen, but I was half way there, so I kept driving. I'm so glad I did. As it turned out, it was a beautiful night in Boulder and not even a drop of rain came down during the concert. As I was setting up, the band did a sound check, which helped me get my recording levels set before the actual show started. Kelly had an uncharacteristic memory lapse as he started singing the first song, "Little Silver Ring." It's a song he wrote when he was 14 years old and has played many, many times. He sang some of the opening lyrics out of order. I can very well understand that kind of lapse due to the extenuating circumstances. It was great to see one of the original members of The Samples, keyboard player Al Laughlin, play as a guest and sing on several of the songs. Laughlin's contribution was greatly appreciated throughout the night. He looked very happy to be on stage playing The Samples songs again. The highlight of the show came in the second set, when Laughlin played keyboards and a special guest Matt played bugle during "Seasons In the City." The crowd rewarded the band with enthusiastic applause when the song was over. The two set concert was short, but sweet, including a good mix of old songs and new songs. While I was writing this review Kelly posted a baby picture on Facebook and announced that his daughter Olivia Claire Kelly was born at 11:25 PM MT on June 11. My recording of the show and some photos I took can be accessed by following the links below. Upstate New York jam band moe. released their eleventh studio album No Guts, No Glory on May 27. I've recorded more than 20 moe. shows over the years, and I really like this band. So, I bought the deluxe version of No Guts, No Glory release on iTunes because it includes three bonus tracks. Read my review of the new album by following the link below. 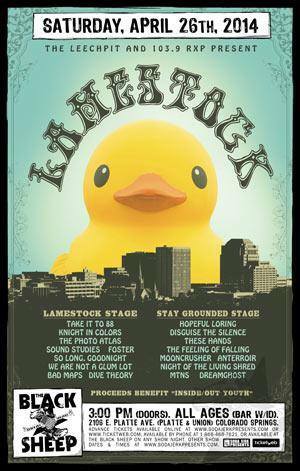 I hoped to record some bands at the Denver Day of Rock over this Memorial Day weekend, but the threat of heavy rain, lightning and hail convinced me to stay in Colorado Springs instead. My back-up plan of recording Justus League at Territory Days on May 25 work out well. 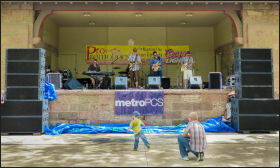 The Colorado Springs based band played between 11 AM and 12:30 PM at the Bancroft Park stage. The weather was great and the band gave us a well played and diverse assortment of music. I had seen them once before, but this time they had their regular vocalist and keyboard player, Matthew Taylor with them. I'm so glad I saw them again with Taylor, because his vocals really brought the band to the next level for me. Wendy Woo opened the show quietly singing the Beatles "Blackbird" solo with an acoustic guitar. Next, Robin Hoch joined her on another cover, "Hey There Delilah" by the Plain White T's. I'd seen the Wendy Woo Band before Robin Hoch became a member and I liked them, but I think adding Hoch improved the band. Hoch's vocal contribution compliments Woo's voice, but her viola playing really embellishes the songs and changes the sound of the band in a positive way. The low key first set felt like a warm up for the second set which was a little bit better in my opinion. Set two started strongly with the original song "Knowledge" from her album Luxury. The second set also featured a couple of songs written by multi-instrumentalist and long time Wendy Woo Band member Chris Maestas who is back to playing drums. Other highlights included "Walk Along the Water" and a cover of John Mayer's "Why Georgia" which I really appreciated. Thanks to the exceptional sound mix and sound board feed provided by Stargazer's front of house sound engineer Jonathan L, I made a recording of the show which is available via the link below. There is also a link to some pictures I took at the show. 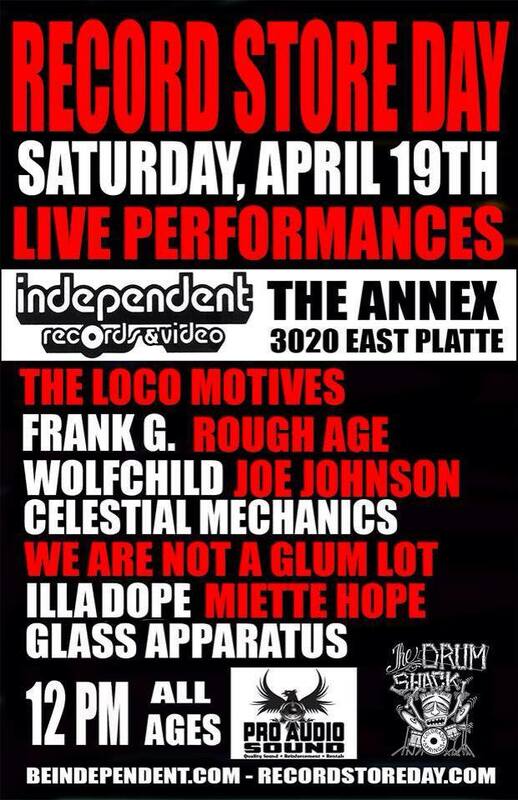 Lamestock, an 18 band live music event was held at the Black Sheep in Colorado Springs from 3 PM to 11 PM on Saturday April, 26. The event was organized to raise money for El Paso County Inside/Out Youth Services. The organization who's mission is to " Educate, empower and advocate on behalf of LGBTIQ youth" raised about $540 according to their Facebook page. I was there primarily to record We Are Not A Glum Lot, but I was able to see the band Bad Maps too, who I also enjoyed. We Are Not A Glum Lot who I saw for the first time last Saturday played with a harder edge at this show. The set list was similar, but I did get to hear one song, Mantra Eater, that I hadn't heard at Record Store Day last weekend. Of course, I took pictures and made a recording which can be accessed by following the links below. 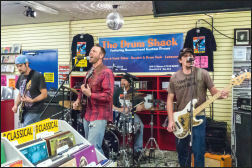 A national Record Store Day live music celebration was held at the East Platte Avenue Independent Records and Video Annex in Colorado Springs on April 19. Ten local bands and DJ's performed from noon until around 7:30 PM inside the popular record & video store. I arrived late, but got set up quickly to record the last five bands that played. The first full set of music I heard was from the Loco-Motives. They are a hard driving, rock and roll band who had some very good songs. Up next was Miette Hope who performing solo with an electric guitar. She had equipment problems that prevented her from utilizing an effects looper that is integral to her solo performances. It's too bad, because she cut her set short due to the equipment malfunction. She has a beautiful voice and her songs were very good too. During her set the customers in the store were very quiet and attentive. Her performance also elicited the most favorable response from the audience that was present. Eads, Colorado based band Glass Apparatus (pictured right) played next. I really liked this band. The lead singer, JC Crockett has a great rock voice and presence. I'll make it a point to see them again. I have wanted to see Sam Erickson's band, We Are Not A Glum Lot, since I first heard him play guitar with Grant Sabin's blues band a couple of years ago. Erickson seems much too young to be able to play guitar as well as he does. His band's music is hard to categorize, but I'll say it's ambient music from what I heard at this performance. Their mostly instrumental songs resonated with me and I enjoyed their set very much. The four piece band performed 5 avant-garde original songs that were unique and well played. The last band to perform was Celestial Mechanics. Though this was another band that doesn't fit conventional categorization I thought they were very good. I also took photos of We Are Not A Glum Lot and the other bands I recorded. Follow the links below to view the pictures. 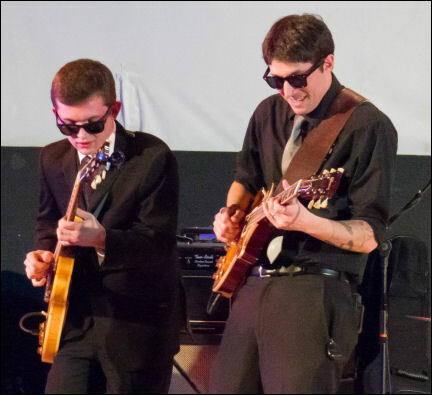 On Friday, March 28 Stargazer's Theatre hosted a 4 band line-up that included Brandon Henderson, from Denver, solo acoustic; Colorado Springs jam band Justus League; Denver's The Robbie Wick's Band and from Colorado Springs the Jake Loggins Band. I was talking to Jake Loggins between sets and he told me he went to school with Brandon Henderson and Robbie Wicks. Brandon Henderson opened the night playing acoustic guitar and singing mostly original songs that were very good. The last song, a cover of the Beatles "Across the Universe" included Robbie Wicks who played acoustic guitar and contributed on vocals. Next up was Jake Loggin's jam band the Justus League. I had not seen them before and I liked them. They started with a cover of the Grateful Dead's "Franklin's Tower" which I appreciated. The Robbie Wicks Band was the most unique band on the bill. Wicks has a very nice voice and his songs are unique. Though difficult to categorize I think they fall into a cross between hippy pop and jam band genres judging from the fifty minute set I heard. One interesting detail is that The Robbie Wicks Band and the Justice League share Austin Johnson on guitar. While Johnson was good in both bands, I liked his contribution in the Justice League best. The Jake Loggins Band closed the night with a stellar set of blues covers. I have seen several incarnations of the Jake Loggins Band. None of the shows had the same line-up, but each one was very good. This night, Colorado Springs mainstay John Wise on bass and vocals and Dwight Bement from Flash Cadillac, on saxophone and keyboards, were part of the band. For me, this was the best set of the night. This line-up with the occasional addition of young newcomer Wyatt Wear on saxophone excelled. I recorded all four sets. I am waiting for permission to upload the other recordings, but I have the Jake Loggins Band set available for live streaming and download via the link below. I also have some photos from each set available for viewing via the links below. 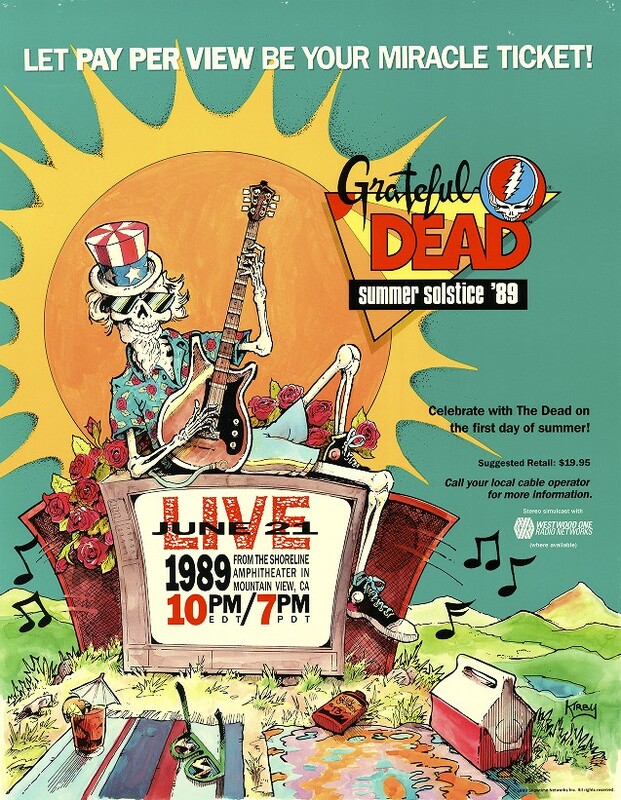 My recordings of the Grateful Dead's three night run in 1990 at McNichols Sports Arena in Denver are now on up on the Live Music Archive. I really enjoyed these three shows for several reasons. They were close to home and the band was rejuvenated with the addition of Bruce Hornsby and Vince Welnick. The song selection was also very good and they played great. Below are links to those audience recordings. They can be downloaded or streamed directly from the Live Music Archive site. Early in 1990 I purchased my first pair of professional quality condenser microphones. By the time of the July 4, 1990 Grateful Dead show in Bonner Springs, KS I had used my Josephson Engineering C-640 microphones in the field many times. But this time was a little different. I used a portable VHS Hi-Fi recorder for the first time to record a concert. This was an improvement over using a compact cassette recorder, because recording in the VHS Hi-Fi format offered better signal to noise ratio but more importantly Hi-Fi VHS format doesn't suffer the motor speed problems that cassettes do. One big drawback of cassette recordings is the pitch of the instruments and voices varies on playback depending on the speed that the tape rolls over the playback heads. Recording and playback motor speed between individual cassette decks varies greatly. So, a cassette recording can sound a bit too fast or slow depending on the deck it is played back on. Audio tracks recorded in VHS Hi-Fi format and DAT, which was becoming very popular with tapers at the time, do not exhibit that problem. But, unfortunately my first outing with the Josephson microphones paired with the VHS Hi-Fi recorder did not go perfectly because the microphone pre-amp I made failed after the first set. So, I was only able to record the first set of that concert. Below is a link to that recording. It can be downloaded or streamed directly from the Live Music Archive site. The second batch of recordings I have transferred are up on the Live Music Archive now. This group is from the Shoreline Amphitheatre in June of 1989. Below are the links to those recordings. They can be downloaded or streamed directly from the Live Music Archive site. 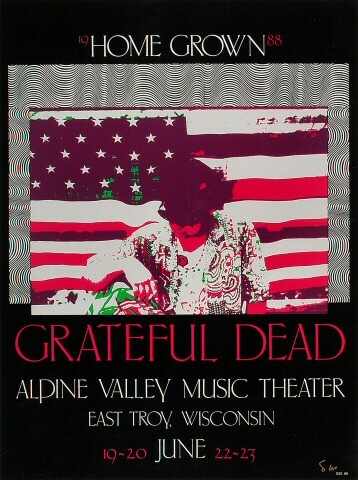 I have finally started transferring some of my old analog Grateful Dead recordings to digital and have uploaded my June 1988 recordings from Alpine Valley Music Theatre in East Troy, WI to the Live Music Archive. 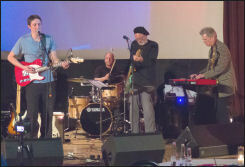 I enjoyed a very good night of blues and rock music at Stargazer's Theatre on Saturday night. 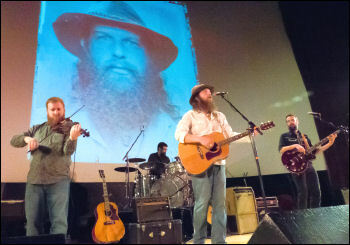 The Jake Loggins band and The Royal Southern Brotherhood were on the bill at Stargazer's Theatre in Colorado Springs. The Jake Loggins Band is the perfect local band to open for RSB. I really enjoy them every time I hear them play. They performed well and really got the crowd warmed up for the headliners. 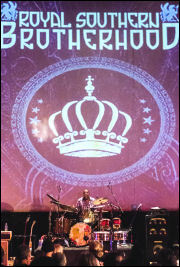 The Royal Southern Brotherhood is an all-star band composed of Devon Allman on guitar and vocals, Cyril Neville on vocals and percussion, Mike Zito on guitar and vocals, Charlie Wooten on bass and Yonrico Scott on drums. They opened strong with their original "You Can Run, But You Can Not Hide." The sound was crisp and clear thanks to Stargazer's front of the house sound engineer Jonathan L.
The set progressed through lots of originals, a cover of the Grateful Dead's "Fire On the Mountain" and a couple of Allman Brothers Band cover's including "Melissa" which Devon Allman told us was the first time the band had performed that song live. The music was very well received by the good sized crowd of mostly older fans. As an unexpected bonus, local blues guitarist Austin Young joined The Royal Southern Brotherhood for a jammed out version of the Allman Brother's Band classic "One Way Out" for the first song of the encore. The night ended soon after with a surprise cover of Rush's "Working Man" and a band signed guitar give away. I recorded both performances and have made the recordings and pictures I took available via the links below. Wow, that was a really bad Super Bowl performance by Denver. I don't think I've ever seen a worse football game. I've got to admire and congratulate Seattle. They beat Denver in every way possible on Super Bowl Sunday. The game started out badly for the Bronco's, with a safety scored by Seattle on Denver's first snap and it just got worse from there. It was just an ugly, ugly loss for Denver and Payton Manning. It sounds like Manning is going to play again next year. So, here's to hoping Denver can rally and do better next year! The Denver Broncos and the Seattle Seahawks will meet on Sunday, February 2 at the MetLife Stadium in East Rutherford, New Jersey for Super Bowl 48. I'm a longtime Broncos fan and I believe the team is as good as it has ever been. Payton Manning has ignited a spark in the team that hasn't been there since the John Elway years. The team has faced hardships such as the loss of coach John Fox for four games, Champ Bailey was out for much of the season, Wes Welker was out with a concussion for key games, and they still maintained the drive and ability to play well and win this year. The half-time entertainment for the big game will be Bruno Mars. I'm looking forward to seeing him. He's a very charismatic performer and I think his style is just right for a Super Bowl half-time show. I feel good about this game. 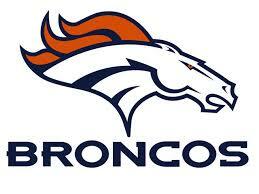 I have confidence the Broncos have the ability to win it all this year. Seattle is a worthy opponent too. So, this game should be fairly even and fun to watch. I think live music and New Year's Eve go well together. It's been a tradition of mine that started in my late teen years to go out and listen to live music on the last night of the year. My first choice, Furthur didn't play on New Year's Eve this year, and I didn't have any real good local options to go out for. 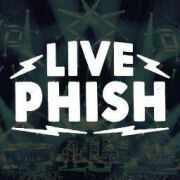 So, I ordered the Phish New Year's Eve live web cast for $20 at LivePhish.com and watched the live concert at home. The concert started late, but that was OK. The multi-camera, professionally shot video and sound were both very good. The live internet feed did drop for me once, right at midnight, but I was able to reconnect quickly. LivePhish.com allows purchasers to watch the web cast again on demand for a few days after the live event. So, I was able to replay parts of the concert again on New Years Day to see and hear the portions of the show I missed. Couch tour shows have their advantages. I've seen several of them and I've liked the experience I had with all of them. Especially since I'm a fan, but not a super fan of Phish it was a great way to celebrate the beginning of the new year without all the hassles of being in a big venue, far from home with a lot of people I don't know. It was nice to be able to get up off the couch and get back to watching quickly when needed and especially good was not being out driving with the typical New Year's Eve drunk drivers on the roads this year. My overall impression of the concert was that the first set was just OK. Good, but not great. They played set two using older instruments and using hockey sticks as vocal mic stands (harkening back to 30 years earlier when they first started out) in the bed of an old flatbed truck that was moved to the center of the floor at Madison Square Garden. That was pretty cool. But, I enjoyed the music they played in set three and the encore much more. It's funny, because when I expressed that opinion to a friend who is a much bigger Phish fan than I am, he said he felt exactly the opposite about the sets. He liked the first two sets best and thought it was one of the best Phish 3.0 shows ever. 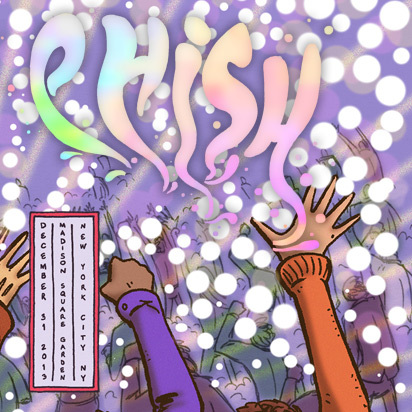 I'll consider ordering the Phish New Year's Eve web cast if they do it again for New Year's Eve 2014. Especially if there isn't a good local live music event to attend in person. I attended and recorded some really good live music events in 2013. There are links to many of the concert recordings I made in the blog entries I wrote throughout the year. One of my favorites of the year was the Elephant Revival show I attended on December 28. I'm really happy with that recording and the recording I made of Steve Poltz who opened that show. Here's hoping there will be plenty of great live music events to see, hear and record again in 2014.